Chapman University has a mandatory parking permit policy implemented by the City of Orange. This policy is designed to promote on-campus parking so as to lessen the impact of street parking on the residents of Orange living in close proximity to the university. All university constituents – students, administrators, faculty and staff are required to have a parking permit and park in university owned or operated parking areas. Once you register, your license plate will be used as validation until your permit arrives in the mail; all permits will be mailed and no longer be available to pick up in person. Please be sure you verify your mailing address when registering. 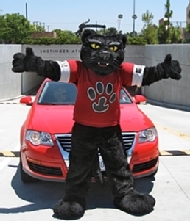 Please e-mail Parking and Transportation Services at parking@chapman.edu with questions. Under certain conditions, the parking permit fee can be waived provided a Permit Fee Waiver is submitted online by the deadline and approved by Parking Services. Filing a false waiver and driving a vehicle to campus (including using a city issued Area-A permit to park closer to campus) may result in disciplinary action and/or a parking citation for violating the Parking Policy. After you have submitted a Waiver Form online (Waiver must be received by the waiver deadline) please print the confirmation page for your records. Student accounts will not be credited the parking fee unless the waiver reason is approved by the Parking Services Office. Summer waiver deadline for the Rinker Campus is May 28, 2019. Fall waiver deadline for the Main Campus and the Rinker Campus is September 16, 2019. Be sure to select the correct term when applying on-line. If you have a valid permit, you must contact Parking Services to deactivate the permit before you can apply for a waiver. I waived my parking fee and now I need a permit to drive to campus, what do I do? Students should contact the Business Office at ocbusn@chapman.edu to charge your account for the permit. Once the account is charged, you can proceed to the registration site to register for a parking permit. Faculty and Staff can log into the registration site to purchase a parking permit.